Just a general heads up - The first section of this article presumes you have watched through season 2 of Netflix's House of Cards. Once I start delving into specifics about season 3, I'll offer up another spoiler warning. But, you have been warned. Binge watching House of Cards is a lot like sitting down and devouring an entire box of Thin Mint Girl Scout Cookies - you feel great from the sugar high while you are chowing down, but a few hours later, once the regret sets in, you wonder why you would waste an entire day or weekend watching a series that has more plot holes than a sieve. And season three of House of Cards was the worst yet when it came to glaring plot holes and broken storylines. In season one, we knew Frank wanted to rise to the position of US Vice President. In season two, it was the presidency that tickled his fancy. This year? Well, there's nowhere else to go. He's already president. The only thing he can really do now is run for re-election, and as the producers of The West Wing can tell you, having the president running for re-election is not as fun as watching him deal with the trials and tribulations of holding the most powerful position in the world. Getting bogged down in the logistics of a campaign is dull. Sure, there's some tension with the various primaries, but there's not a whole lot that can happen for good television while your lead character is traipsing around the central United States giving stump speeches. 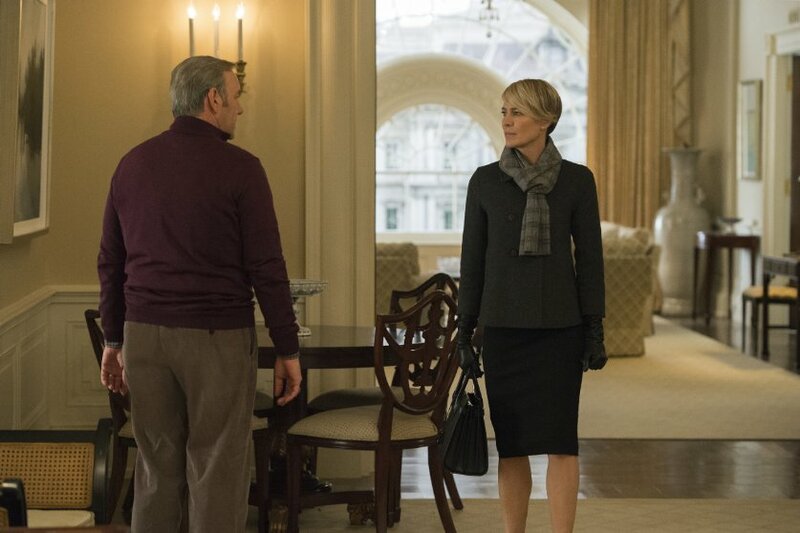 Without another level to ascend to, Frank's killer instinct (the key character trait that has turned Frank Underwood into a character people seem to care about) gets wasted. It's fun to watch Kevin Spacey chew scenery, but without an outlet for his scheming, Frank quickly becomes a character without any real purpose. And that is where we are at the start of season three. 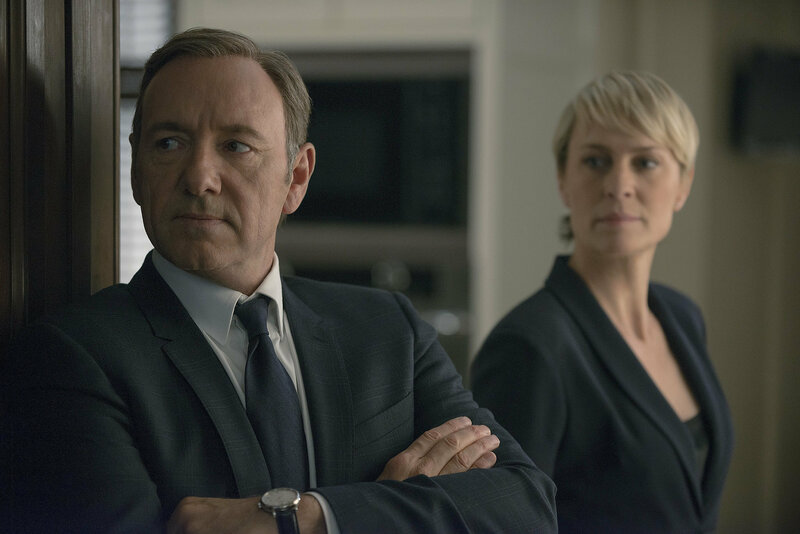 Now, House of Cards claims it isn't concerned with politics. 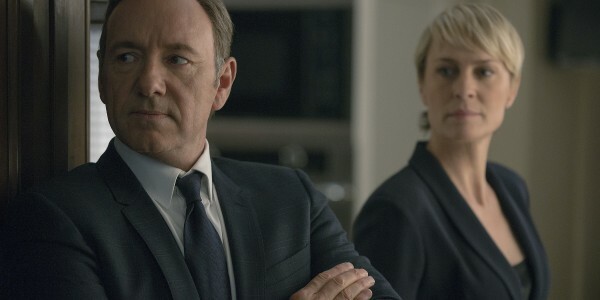 As creator Beau Willimon has mentioned in a number of interviews, the focus of the series is the relationship between Frank and Claire, as well as the general struggle for power. And yes, the relationship between Frank and Claire is the touchstone of the entire series. But the political situation that surrounds these characters is also essential. Frank Underwood doesn't exist without a political world to play in. Negotiations with foreign nations matter. The battles he engages in (and, the battles Claire engages in) matter to the overall structure of the series. But it seems that, to the show's writing staff, these moments (which are presented as massive power struggles) only matter so long as Frank or Claire is in the middle of a negotiation. There is no fallout. There is no follow-up. Which can work just fine when it's clear Frank and Claire have larger goals that are served by their victories. But once Frank is president and there is nowhere to go but down, these battles should become the main story. Frank needs to constantly win to maintain his tenuous hold on his position. Losing face means losing support which can translate into losing the presidency. The stakes should be higher than ever. Then, why is it that in season three, the political power brokering feels even less important than it did in seasons one and two? Why are massive international plotlines - stories that dominate the front half of the season - completely abandoned without any follow-up? It's sloppy and uninspired. And it makes for the most uneven season of House of Cards yet. Spoilers for season three of House of Cards follow! You have been warned . . . I feel like I should start with the positives for season three, and yes, there are certainly some positives. House of Cards might have really fallen of the tracks in terms of overall story quality this year, but that doesn't mean there weren't some really excellent moments throughout the season. 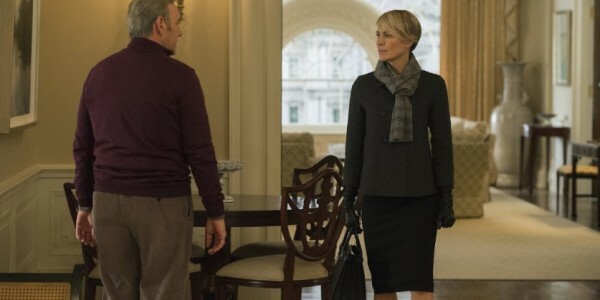 Robin Wright, once again, gave a nuanced and complex performance. While Claire's motivations throughout the season were a bit muddled (she decides to leave Frank now, despite knowing that, from day one of the series, the goal was to promote him to the presidency? Oy. ), Wright was able to hold my focus throughout the poor dialogue and confusing plots. That scene with Claire and the Russian ambassador in the bathroom? That was pretty amazing. 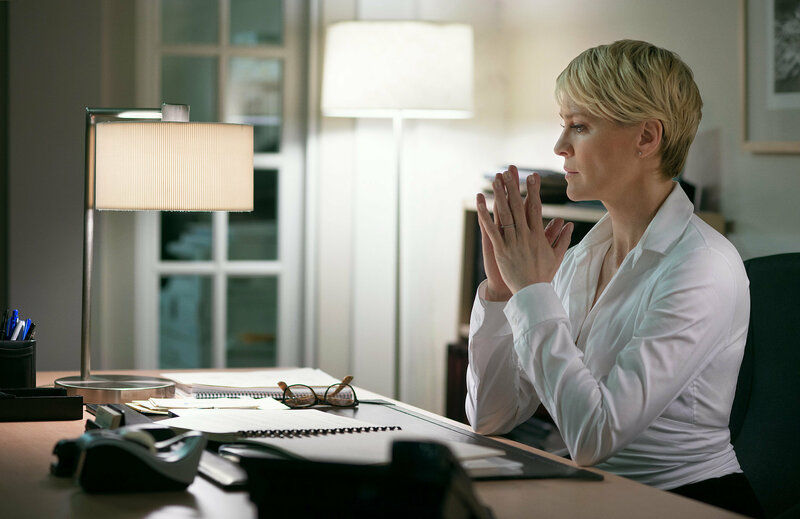 My major hope for season four is that we get to truly see Claire Underwood on her own, without Frank in the wings supporting her in any way. Now, I doubt that will happen much, if at all, but man, that would be a heck of a show. I also have to give kudos to Michael Kelly for his work as Doug Stamper. Doug's storyline felt as if it was on fast forward this year while the rest of the show moved at a slower pace (from falling off the wagon to clean and sober all in the span of 13 episodes, with very little time spent really ruminating on the massive emotional toll this has taken on Doug), Kelly successfully made me like Doug for several moments this season. And that is quite a feat, as Doug is one of the most odious characters on the show (which is also saying quite a lot). I still don't really buy into Doug's infatuation with poor Rachel, but I was glad to see that the show opted to end that particular subplot once and for all. But taken as a whole, season three was just plain confusing. After last season's debacle with the Chinese and the Tusk fiasco, I was hoping for a more streamlined season from a story perspective. Making Claire the UN ambassador was all well and good, as was showing how over-matched she was, but allowing it to drag out for several episodes was sloppy. And then, after spending all that time hyping how crucial having an Underwood power player in the UN was to the situation in the Jordan Valley, there's zero mention of who replaces Claire as the ambassador? Or even what is happening with the Jordan Valley after the whole deal falls apart? Then there is the whole mess with Russia- we get it, Petrov is a nasty guy and his regime is not to be messed with. But with the amount of time we spent learning about him and seeing him best Frank, Petrov is suddenly dropped from the storyline once Frank jumps into the campaign? Isn't Russia still going to be throwing its weight around even when Frank hangs up the phone on Petrov in a huff? The series simply dropped all of these storylines with no warning. I completely understand that the presidential campaign has far more bearing on Frank's future than his spat with Russia, but doesn't his spat with Russia also have bearing on his campaign? Won't people want to understand what happened in the Jordan Valley? I guess I might be giving the voters in the House of Cards universe a bit too much credit, but one would think that Heather Dunbar might want to press him on these issues if she hopes to really have a shot at winning the election (which, really, I think we can all agree she does not, since she still have scruples and principles). The scattered plots of the season didn't even coalesce well in the final, where we finally saw tensions come to a head between Frank and Claire. Considering this was the only real twist in the entire season (strange for a series that prides itself on surprising its audience), it rang just as hollow as the rest of the season. Both Frank and Claire went into this journey knowing full well what it would take. Both have done some pretty awful things to get here. Claire knows who she married and Frank knows that Claire isn't the type of person to stay in the background forever. This separation was inevitable, but neither really has a leg to stand on in terms of moral high ground here. I've largely treated the first two seasons of House of Cards as fun over-the-top escapist television. It wasn't going to be making any top ten lists for me, but it was a fun way to spend a week in February. After watching this season, the show has officially become more tedious and fun (especially since we didn't even get multiple Cashew sightings- just the single scene- which might be the worst sin of all this year). Which is disappointing. I love to watch Kevin Spacey chew through the scenery as much as the next person. I just wish the show cared about presenting complete stories, rather than a smorgasbord of nothing.